“William Faulkner’s Books: A Bibliographic Exhibit” is located in the Faulkner Room, J.D. Williams Library and will be up from January 2nd through December 12, 2014. 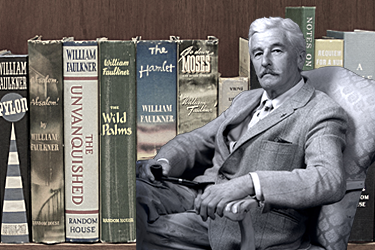 Library patrons will have the opportunity to learn about William Faulkner’s extensive literary career. The exhibit features 20 cases dedicated to books and artifacts that go along with them. Featured books include Soldier’s Pay, As I Lay Dying, the Sound and the Fury, Absalom, Absalom! among others. The display will also include a case featuring The Marionettes, a play Faulkner penned in 1921, hand-bound and illustrated. Other items include original Faulkner poetry manuscripts, manuscripts from the Rowan Oak Papers, original short stories in periodicals, and photographs from the Col. J.R. Cofield Collection and the Martin Dain Collection. Original items on display document the struggle against segregation and oppression in the South. Among the many topics covered are the University of Mississippi, photography, music, and politics. From original record contracts for Elmore James and Sonny Boy Williamson, rare sound recordings by Robert Johnson and Charlie Patton, artwork by Lightnin' Hopkins and James "Son" Thomas and records from B.B. King's personal record collection, this exhibit traced the blues back to its origins. "Hail to the Chief!" traces the history of presidential campaigns and elections in the Magnolia State and features original letters, photographs, documents, and ephemera related to presidents ranging from George Washington to George Bush. An historical overview of the genre from the 1840s through the present. Featuring authors such as W.C. Falkner, Ben Ames Williams, Newton Gayle, Elliott Chaze, Julie Smith, Ace Atkins, Thomas Harris, Nevada Barr, Carolyn Haines, Martin Hegwood, Charlaine Harris, and many more. The department created these exhibitions for the year long observance of the 40th anniversary of the integration of the University of Mississippi. The authors showcased in this exhibit have chosen to utilize the very real drama of the Civil Rights Movement within their own fictional creations. This exhibition was on display August 1st, 2002 until November 4th, 2002. This exhibit examines the African American education system in Mississippi before integration. 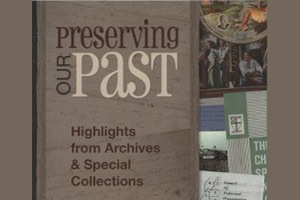 This exhibition is on display from November 4th, 2002 until April 1st, 2003. An exhibit devoted to the experiences and family histories of Lafayette County's African-American community from Reconstruction through the Civil Rights Movement and into the early 1970s. The exhibit combines materials already held in Special Collections with collections on loan from members of the community. The Exhibition will be displayed April 1st, 2003 until September 1st, 2003. Selections from "1975-2000: A Silver Anniversary Exhibition"
Selections from "A Faulkner 100: The Centennial Exhibition." 27 July- 22 December 1997. Selections from "The University of Mississippi: A Sesquicentennial Exhibition." October 1998-July 1999. Selections from "Facets of Faulkner." July-December 1999. Selections from "Col. Prentiss Ingraham: King of the Dime Novels." A mini exhibition. Fall 2000-Spring 2001. Selections from "Land That We Love: Patriotic Images." A small exhibition on display from September 2001-January 2002.